Friday 7 August , on the 60th. anniversary of his priestly ordination, Fr. 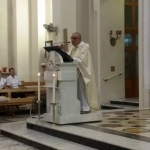 Dionysius Mintoff OFM celebrated Mass at the Church of St. Francis in Hamrun in the presence of the Friars of the fraternity, family and Franciscan community and friends. During the homily Fr. Dionysius described how with the help of God during his life he performed various tasks especially in the Peace Laboratory.